Récolte d’ananas au Morne Rouge. This postcard is from Le Morne-Rouge, a small town located in the northern part of the island of Martinique. Le Morne-Rouge is, apparently, a hotbed of pineapple activity. Just keep in mind that the “majestic mountain” also happens to be a volcano, whose massive 1902 eruption earned it the distinction of being the third most deadly volcanic eruption of all time. 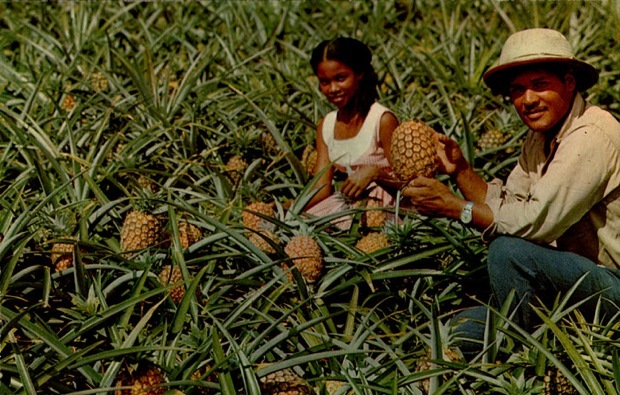 Martinique’s love of the pineapple has also “erupted” in the form of rare and exotic culinary traditions. Pineapple “cut in a fancy way!? !” If that doesn’t make you want to get off your duff and book a flight right now, then someone needs to check you for a pulse. In 1997, Martinique played host to the Second International Pineapple Symposium, where B. Aubéry presented a paper entitled Pineapple Production in Northern Martinique which probably talks about Le Morne-Rouge in some detail, but I’m too cheap to pay the €10 to find out. Besides, I think my money would be better spent on the gripping On Farm Approach Of Pineapple Fruitlet Core Rot Disease In Martinique (F. Marie, E. Malezieux, J. Marchal, X. Perrier), from the Third (and probably better) International Pineapple Symposium (Thailand, 2000).